Some housekeepers, to avoid the trouble of frequent bakings, line several tart dishes with an edge of crust; bake them, and keep them for use as required, when some preserve or raw fruit as above may be simply laid in and an easy tart produced upon an emergency. – Frost, Sarah Annie. Godey’s Lady’s Book Receipts and Household Hints. 1870. Philadelphia. A foole, later shortened to fool, is a dessert made by blending pureed sweetened fruit with sweetened whipped cream or cooled custard. It can easily be traced from the 17th century, and with a little effort could probably be found earlier. It is as delightful and refreshing today as it was centuries ago. The exact origin of the dish is lost to time, as are many others. Some sources claim it began in the 14th century, which it well may have, while others date it to 1598 though no one seems to quote the source for the recipe from that date. The earliest I have found so far is from 1658 in The Good Huswife’s Jewell by Thomas Dawson. – London. 1658. The origin of the word fool was found in Ebenezer Cobham Brewer’s Dictionary of Phrase and Fable: Giving the Source, or Origin of Common Phrases, Allusions, and Words that have a Tale to Tell. The information continues to be passed from book to book and blog to blog today. “A corruption of gooseberry foule milled, mashed, pressed. The French have foulè de pommes; foulè de raisins; foulè de groscilles, our ‘gooseberry fool. 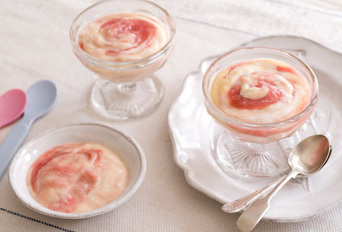 Gooseberry fool is a compound made of gooseberries scalded and pounded with cream”. – 1905. London & Philadelphia. The receipt from The Compleat Cook is for a custard-type base with fruit. Receipt as follows. Take your gooseberries and put them in a silver or earthen pot, and set it in a skillet of boiling water, and when they are coddled enough, strain them; when they are scalding hot beat them well with a good piece of butter, rose-water and sugar, and put in the yolk of two or three egg, you may put rose-water into them, and so stir it altogether and serve it to the table when it is cold. Annonymous. London. 1658. For comparison, I offer Robert Smith’s receipt from 1725, also a custard-base dessert. Take a quart of gooseberries and scald them tender and drain them from the water through a cullender, squeeze them with a spoon. Then take a quart or three pints of new cream and six eggs, yolks and whites well beaten, and put to the cream, grate a small nutmeg into it and mix some orange-flower water and sugar and sweeten to your palate: Set all over a gentle fire and stir it until you see it of a good thickness, then take it off and cool a little, put into dishes. – Smith, Robert. Court Cookery. 1725. London. The following is a classic early 18th century version of fool which was not custard-based. Scald two quarts of young gooseberries till they are soft, put them through a hair sieve with the back of a spoon, sweeten the pulp very well. When cold, mix it with a little thin cream or milk till it is smooth, then add thick cream; mix it well, and send it to table. N.B. If you like the seeds, put the gooseberries when scalded through a cullender instead of a sieve. – Taylor, E. The Lady’s Housewife and Cook Maid’s Housewife. 1769. While gooseberries were initially the most commonly used fruit for fools, other fruits in season were soon found in cookery books such as strawberries, raspberries, apples, apricots, cherries, etc. A receipt for strawberry or raspberry fool was published in 1739. Take a pint of Raspberries, squeeze and strain the juice with orange-flower water; put to the juice five ounces of fine sugar; then set a pint of cream over the fire, and let it boil up; then put in the juice, give it one stir round, and then put it into your bason; stir it a little in the bason, and when it is cold use it. – Smith, E. The Compleat Housewife: Or, Accomplished Gentlewoman’s Companion. 1739. London. In the absence of fresh fruit jams and jellies were used, making it possible to serve the dish year-round. For a modern twist, I put the mixture into a graham cracker pie crust and freeze it. I serve it thawed, but with just a hint of ice crystals still present for a light summer dessert. Thanks for the comments from those who enjoyed the mustard article. For a little extra texture, try leaving some of the seeds whole or coarsely crushed. Grainy mustard is especially good in tuna and white bean salad. There is an entire museum devoted to mustards from around the world. It is located in Middleton, WI. The owner claims 5,300 varieties of mustard from around the world. They boast an exceptional collections of mustard pots along with advertising pieces, jars, and tins. If just looking at the mustards leaves you wanting more, visit the museum shop where you’ll find mustards galore to take home. There are a number of theories about how Scotch eggs came to be, but before we investigate their origins we must discuss what they are and how they’re made. Scotch eggs are hard-boiled eggs wrapped in a raw meat mixture (usually sausage in recent decades), rolled in bread crumbs, and fried or baked until golden brown. They have also been called bird’s nest eggs and forcemeat eggs in previous centuries. Forcemeat is a common term from earlier time periods which simply referred to minced meat. In discussing the origins of the eggs, we must first consider the claim by Fortnum & Mason of London that they invented the dish in 1738. – source: an email from Leonard, Wayne, Customer Relations Advisor, Fortnum & Mason, 181 Piccadilly, London. They opened for business in 1707 when William Fortnum, footman in Queen Anne’s household, persuaded his landlord, Hugh Mason, to go into the grocery business with him. They were appointed grocers to HRH, the Prince of Wales, in 1863. They were and still remain known for their prepared foods and carry-out hampers. While every Scottish cookery book worth its salt containing traditional dishes includes a recipe for Scotch eggs, if Fortnum and Mason’s claim is true, they are English in origin and not Scottish at all. Their spokesman did confirm their claim to having invented Scotch eggs in 1738, however, it may be that they didn’t so much invent the eggs as they may have improved them, and they certainly seem to have been the first to market them ready-made. Spokesperson for Fortnum & Mason says, as we would expect, that eggs were smaller in the 18th century and the meat scraped for the forcemeat would have been gamier, “like a strong Victorian pate`. Interestingly, Fortnum and Mason were appointed Grocers to HRH, the Prince of Wales in 1863, and since the firm had been selling ready-to-eat Scotch Eggs for some 125 years by then, along with other upscale ready-to-eat treats, it is quite possible that the royal family consumed them as did many others in and around London. Our second theory as to their origin begins much earlier in India. In the very early 1600’s, the East Indian Company was formed and trade began between the British and India. 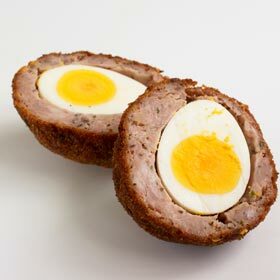 Some believe Scotch eggs evolved from an Indian dish called Nargisi Kofta, which is made by wrapping hard-boiled eggs in minced lamb and cooking them. The Daily Mail supported the claim that British soldiers found them tasty and upon returning home to England had the eggs made for their families. – Hope, Annette. A Caledonian Feast. A restaurant review found in the Cincinnati Magazine says Nargisi Kofta was made by wrapping minced lamb around the eggs and cooking it in a sauce. They were supposedly named for the Narcissus which they are said to resemble when sliced in half. – June 1980. Another theory is that Scotch eggs are, “a Northern variant of Cornish pasty produced by Scottish smallholders who would have kept chickens and pigs”. They were in essence a poor man’s lunch, made from left-over meat and eggs, quite handy because they were so easily transported. – Chambers, Neil, owner. The Handmade Scotch Egg Company. Herefordshire. The earliest known published recipe titled Scottish eggs dates to 1807. Maria Ketelby Rundell’s version published that year is found verbatim in several cookbooks from that time period. Boil hard five pullet’s eggs, and without removing the white, cover completely with a fine relishing forcemeat in which let scraped ham or chopped anchovy bear a due proportion. Fry a beautiful yellow brown, and serve with a good gravy in the dish. Twenty-one years later a recipe appeared which was very similar. Scotch Eggs.-Five eggs make a dish. Boil them hard. Shell and dip them in beat egg, and cover them with a forcemeat made of grated ham, chopped anchovy, crumbs, mixed spices, etc. Fry them nicely in good clarified dripping or lard, and serve them with a gravy sauce separately. The earliest recipe found for Bird’s nests was published in 1871. Eggs are boiled hard and each surrounded by forcemeat; after which it is fried or browned and laid in the dish with gravy. – Orr, N., Mrs. De Witt’s Connecticut Cook Book. 1871. NY. A recipe for Forcemeat Eggs was published in 1872. Boil six eggs till the white be firm; peel off the shell, cover them thickly with the forcemeat in the preceding receipt; fry them till quite brown, and serve in a rich brown gravy. – Fox and Company Publishers. The Cuisine, Containing Household Cooking Recipes. 1872. Boston. The forcemeat recipe referenced above was made from veal pounded in a mortar with fat and butter, bread crumbs, parsley, salt and pepper, cream, and egg-yolks. Marion Harland’s version published three years later was made from 1 cupful of minced chicken, ham, veal, or tongue, 1 cupful of rich gravy, ½ cupful of bread crumbs, parsley, onion, summer savory or sweet marjoram, juice of 1 lemon, and 1 raw egg lightly beaten. The mixture was combined and wrapped around six hard-boiled eggs as above and browned in the oven. – Harland, Marion. Breakfast, Lunch, and Tea. 1875. NY. Note: If you can get them, free range eggs make a much nicer presentation than the pale-yolked grocery store eggs. This dish is so simple that it merits using the best ingredients available. Harland’s recipe was republished verbatim in 1905. – Wilcox, Woods, Estell. The Original Buckeye Cook Book and Practical Housekeeping. 1905. St. Paul. Copyright. Information from this site may not be reproduced without written permission. Thank you. Victoria Rumble, The Historic Foodie. Recently the memory of a fruit my grandmother and uncle grew in South Central Tennessee popped unexpectedly into my mind, rather surprising, since I hadn’t thought of it since I was a young girl. Once the memories surfaced, however, I could see the fruits as well as if I were holding one in my hand and the delightful fragrance, which I hadn’t smelled since my childhood, haunted me until I began to research the fruit to first, determine what it was I was remembering, and to see whether I could find seeds to grow some. The fruit I remembered, is actually a melon, albeit a very small and unusual one. Descriptions I found in long shelved horticultural books, written decades before publishers had the ability to include a glossy color photograph with the articles, are exactly as I remembered. It’s appearance is beautiful, the hue being bright glossy red, with stripes of yellow running round, like the meridian lines on a globe. – Gosse. For those non-history oriented readers, note, that regarding fruit, vegetable, or, in this case melons, “glossy red”, is actually more rust or maroon colored than bright red. Another writer termed it, “mottled with yellow and brown”, while some saw it as, “beautifully striped with red and gold”. – Bulletin, South Dakota & Journal Horticulture, Oct. 16, 1866. The melon is of ancient origins and through the years has had several names. It has fallen in and out of favor through the decades as have many other garden varieties. This miniature melon is, I believe, of very ancient date, and is like an old coat or old song—destined to become quite in fashion again”. – Country Gentleman. 1867. It was commonly called the Queen Anne’s Pocket Melon, however, in the American South it was more often called the vegetable pomegranate, later shortened to pomegranate. Even later, that was corrupted into, “plum granny”, by those whose speech patterns hail from the Appalachians. When I asked my mother what I was remembering, I told her I thought I remembered it by that name, but that a pomegranate grew on a tree and looked nothing like what I remembered. Early nineteenth century writers shared similar notations. All through the South these melons are known as ‘pomgranates,’ though they are in every way unlike the tree pomegranate…the same name has also accompanied them into the North and West, as far as Missouri and Kansas at least. – Gardener’s Chronicle. 1894. When first written of in the U.S., it appears to have come with the Europeans, especially the French who knew it as melon Dudaim where it was described in Les Plantes Potagères. – Report. NY. Other French writers referred to it as Concombre Dudaim, Melon de senteur, Citrouille odorante, melon des Canaries, Pomme de Brahms, and Pomme de Grenade. – Gardener’s Chronicle. 1894. The French grew it so commonly, that a Frenchman, Monsieur Loisel of Paris, had devised a system of growing it whereby soil was earthed up some five feet across in each direction, and two feet high. A hole was made in the center of the mound and filled with, “well-rotted manure or compost”, after which the mound was covered with about six inches of soil. Having been so prepared in the spring, the mound was then left until the next May when plants were set out in the top of the mound. As the vines grew, they ran down the earth mound in every direction, each producing a quantity of melons. Monsieur Loisel penned a valuable treatise on melon culture which was used quite extensively. – Floral World. John Perkins did much to promote the culture of the melons after they had fallen somewhat out of favor in the wake of discovering new exceptionally sweet varieties in the early 19th century. Perkins published instructions for growing them in pots for those who so chose. Everyone must be grateful to Mr. Perkins for drawing attention to that valuable but too-little known Queen Anne’s Pocket Melon. – Penny Cyclopaedia. The melons had enjoyed a resurgence in interest by the 1870’s when it was reported that having “once [been held] in high repute, was so nearly extinct that a few seeds only were saved by accident”. Report. Washington. Opinions differed as to the importance of the melons for eating, although all who had ever encountered one commented on the welcome fragrance they imparted. An account published in 1862 called it more pretty than useful, the fragrance permeating a room where some four or five might be placed in a dish. – Journal Horticulture. Because the melons lacked sweetness compared to watermelon and cantaloupe, some suggested serving it prepared with sugar and wine to impart the sweetness and flavor desired, or to use it for making preserves and stuffed mangoes, “a name no more appropriate to it than pomegranate or mock orange”. – Annual Report. Missouri. A mango was any vegetable such as cucumbers and peppers which were filled with spices and other items, tied shut, and immersed in a vinegar solution, but that will have to wait for another day. To make jelly from the melons: “Select fruit that has not become too ripe; peel, cut into quarters; cook till soft, then strain juice from pulp. To 1 quart of juice, add an equal quantity of sugar, then boil until thick – the same as any jelly. Sugar may be added to the pulp and boiled to make pomegranate butter”. – Bulletin. S. Dakota. Many writers wrote, as did the Universal Cyclopaedia, (1900) that they were much appreciated for perfuming rooms or wardrobes. This was, after all, before modern room fresheners. A most delightful account was penned by a British man who lived for a period of time in Alabama in the 1850’s. Perhaps his statement that they were not eatable was personal choice, as many in this region did eat them. Smell-Lemon…The smell is very fragrant, and hence they are often placed on ladies work-tables; they are not eatable, and I know of no other good qualities that they possess other than their beauty and perfume. Children are fond of carrying them in their pockets, and tossing them about as play things. I have seen what I suppose to be the same species in some of the London shops, particularly at a fruiterer’s in the Poultry, where it is ticketed as Queen Anne’s Pocket Melon. – Gosse. 1859. I eagerly anticipate harvesting my first ripe melons, whatever you prefer to call them, and reliving my childhood memories of them. Gosse, Philip Henry. Letters From Alabama. 1859. London. The Floral World and Garden Guide. Volume 3. March 1860. London. The Penny Cyclopaedia of the Society for the Diffusion of Useful Knowledge. Vol. 8. London. 1837. Journal of Horticulture. Cottage Gardener and Country Gentleman. Vol. 11. Oct. 16, 1866. Ibid. Vol. 2. March 4, 1862. Gardening Chronicle. July 14, 1894. As written by William Trelease in the fifth Annual Report of the Missouri Botanical Gardenon April 24, 1894. Country Gentleman. Vol. 30. July 18, 1867. Albany, NY. Report. U.S. Department of Agriculture. 1877. Washington, Govt. Printing Office. Annual Report. Board of Control of New York Agricultural Experiment Station. 1888. Albany. Bulletin. South Dakota Experiment Station. July 1899. Sioux Falls, South Dakota. Bulletin 65. For those always fighting the Battle of the Bulge, mustard is much more calorie-friendly than mayo, and the foodies who lean toward historic foods are receptive to it because of its longevity. Let’s take a closer look. Mustard was in constant use in the 18th century in dressings, sauces, and as a flavoring. The tender leaves were used in salads, but the seeds were more prized for culinary and medicinal purposes. 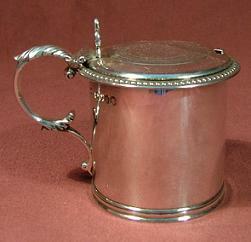 A silver mustard pot. Silver mustard pots had a glass insert which prevented the vinegar in the mustard from reacting negatively with the silver. The liners were often red or cobalt blue in color. The silver pot was often worked in an open pattern showing the glass liner inside. There is an opening in the lid for a spoon. Such pots were still being used well into the 19th century. The EDC, Europeenne de Condiments, website credits the Chinese with being the first to grind mustard seeds and mix them with an acid (verjuice) to make prepared mustard some 3000 years ago. It would be many centuries before that first coarse mixture became the creamy condiment upper class French citizens recognized by the mid-1600’s. If they had mustard at all, the poor of France continued to make do with a coarsely made product very little different from that of the Chinese into the 17th century, although the upper class was very familiar with the better mustard of Dijon, that region having produced a product of such quality it was granted the exclusive right to prepare it in 1634. Pope John XXII, a Frenchman, was so fond of the peppery condiment that he established a position for mustard maker, or moutardier, during his service as pope [1316-1334]. That position remained continuously filled until the 1930’s. The “mustard-maker” was referred to in poetry published in several works by the 1740’s. – Swift, Johnathan. The Works of Johnathan Swift. 1742. Dublin. Whole seeds could be purchased for use at home or the seed could be harvested from crops grown at home. To do so, the weeds are kept hoed out and the ground clean around the plants until the seeds ripened. When the seeds ripened and the pods turned brown, the stalks were approximately two feet tall. The stalks were then cut and placed on cloths to dry for two to three days after which they were threshed out for use. – Mills, John. A New System of Practical Husbandry. Vol. 4. 1767. London. Once the seeds were threshed out, they were crushed or ground into a powder for kitchen use. Mustard seed would sprout even when many years old, and because of the ease with which the plants sprouted and grew, Arthur Young advised farmers that once they sowed mustard on their fields they may as well be prepared to devote the field permanently to the culture of mustard. When once sowed on a piece of land, it can never be got out again; in tillage it rises with every crop that is sown which obliges the farmers to lay down such fields to grass which smothers it, but if broke up again centuries afterward, a crop of mustard is sure to rise. – Young, Arthur. A Six Months Tour Through the North of England. 1770. London. Flour of mustard, ready to be mixed with vinegar for made mustard, was advertised for purchase by the 18th century. “For those who are Lovers of fine Mustard, there is [sic] a few Bottles at Six Pence per Bottle, of fine Flower of Mustard, which for its Goodness, I defy the Kingdom to produce better”. – The Weekly Amusement. Saturday, February 22, 1734. Numb. XVI. London. To Make Flour of Mustard. Those who live in the country, or go to Sea, have frequent occasion to use Mustard, when there is no opportunity of getting it without extraordinary Trouble. It is a Sauce seldom thought on till the Minute we want it; and then, according to the old Way of making it, if we are lucky enough to have Mustard-Seed in the House, we must spend an hour in the ceremony of grinding it in a wooden Bowl, and an Iron Cannon-bullet, according to the old Custom; or if we have Mustard by us, ready-made, if it has stood a Week, it is then of no value, if it is in small quantity. But to obviate this Difficulty, the Invention of grinding-Mustard-Seed in a Mill, and thereby reducing of it to Flour, to be made fit for the Table in an instant, has been very well received: for by that Contrivance we have it always fresh, and ful of brisk Spirits, and may only make just what we want without any spoil, as long as we keep a Stock of this Flour by us. There are two Sorts of Mustard: viz. The white Sort, which is a large Grain, and not so strong; and the black Sort, which is a small Grain. That which I account the best is from the wild Mustard, commonly found growing in Essex, which sells the best in the Markets. But from whatever Place we have it, regard should be chiefly had to its being free from Mustiness, which happens from the gathering the Seed wet, or in the Dew, and laying it close together before it is thresh’d. When this seed is dry and sweet, grind it in a Mill, such as a Coffee-Mill; but the Mill must be fresh, and free from any Flavour or Taint; it should not be indeed be used with anything. When you have ground a sufficient quantity, pass it through a pretty open Sieve, and the next day put it into Vials with open Mouths, pressing it down close; stop them well, and keep it for use. When you want good Mustard for the Table, take a spoonful or two of this Flour, and as much boiling Liquor from the Pot where beef or pork is boiled, as will make it of the Consistence you desire, stirring it well till it is mixt for your Purpose; or for want of such Liquor, boil a little Salt and Water together, and mix your Mustard-Flour with that: but in either of these ways you must observe, that while your Mustard is warm, it will last better. Some who do not love their Mustard over-strong put equal Quantities of the white and black Mustard-Seed into the Mill, and then the Flour will not be so poignant to the Palate, and will have a brighter Look. If your Mill be set very sharp, the Flour will be so fine, that it need hardly be sifted. – Bradley, Richard. The Country Housewife and Lady’s Director, in the Management of a House. London. Well before Richard Bradley penned the previous passage, John Evelyn spoke of using a quern or cannon-bullet to grind mustard seed. A quern is made of two millstones, one atop the other and turned by hand by grasping a wooden handle set into the top stone. – Evelyn, John. Silva, Or, a Discourse on Forrest Trees. 1729 edition. London. Mustard was used with oil and vinegar in dressing salads and it was used in various mixtures as a sauce. Such sauces were sometimes cooked but not always. Butter and mustard were combined to dress a number of dishes, and Hannah Glasse and others instructed that the two be mixed and served in a cup at table. – Williams, T. The Accomplished Housekeeper and Universal Cook. 1707. London. Most cookery books written during the 18th century spoke of prepared mustard as a sauce for beef much as steak sauce is today. Hannah Glasse’s sauce to be served with a ragoo of hogs feet and ears was made from half a pint of good gravy [strong broth or drippings], a glass of white wine, a good deal of mustard, a good piece of butter rolled in flour, and a little pepper and salt. The ingredients were stirred well together until it thickened. – Glasse, Hannah. The Art of Cookery Made Plain and Easy. 1774. London. A simple 18th century receipt for making “made” [prepared] mustard was to grind the seed into flour and mix the flour with white wine vinegar. – Smith, Robert. Court Cookery: Or, The Compleat English Cook. 1725. London. Some receipts were a little more complex and of a little more delicate flavor. “Take a quart of the best mustard-seed you can get, let it be well dried, finely beat and sifted; then put, to mix it, two parts white-wine vinegar, and one sack, also one spoonful of double-refined sugar; stop it close and it will keep a year”. – The Universal Magazine. Vol. 4. January 1749. Mustard seed were used extensively throughout the 18th century to add flavor to pickled vegetables. Sarah Harrison’s recipes used them in pickling small melons, codlins [apples], peaches, walnuts, cucumbers, onions, etc. – Harrison, Sarah. The House-Keeper’s Pocket-Book, and Compleat Family Cook. 1760. London. Some receipts had the cook put the seeds in the crocks loose, while others had the cook fill an open cavity in a pepper, melon, or cucumber with the seeds and then cover the whole with vinegar. That process was known as a mango. The seeds were removed from the item to be preserved creating the cavity which was then filled with mustard seeds or a mixture of mustard seed and other spices. – Harrison, Sarah. The House-keeper’s Pocket-Book; and Compleat Family Cook. 1739. London. One might think, given the apparent quality of medieval French mustard that by the 18th century it was so readily at hand that making it at home was a thing of the past, but such was not the case. Even a century later advice was given to frugal families on making it to the best advantage, avoiding adulterations commonly found in both made mustard and in flour of mustard. For those in out of the way places where goods had to be carried over rough terrain, mustard seed were far lighter in weight and easier to pack than prepared mustard which in itself determined what goods likely found their way into frontier homes. “MUSTARD: Why buy this, when you can grow it in your garden? The stuff you buy is half drugs; and is injurious to health. A yard square of ground, sown with common Mustard, the crop of which you would grind for use, in a little mustard-mill, as you wanted it, would save you some money, and probably save your life. Your mustard would look brown instead of yellow; but the former colour is as good as the latter: and, as to the taste, the real mustard has certainly a much better than that of the drugs and flour which go under the name of mustard. Let anyone try it, and I am sure he will never use the drugs again. The drugs, if you take them freely, leave a burning at the pit of your stomach, which the real mustard does not”. – Cobbett, Wm. Cottage Economy. 1833.